The Craddock or Cradock or Cradocke family appears on this Man family website site for the following reason: in about 1635 Tobias Cradock married Susannah Bourne and they had at least two children: Richard and Susannah. Susannah married Dr. Henry Barnes and they had a daughter Susannah Barnes who married John Balchen. John and Susannah’s granddaughter Mary Balchen married John Man. (i.e. Craddock > Barnes > Balchen > Man). 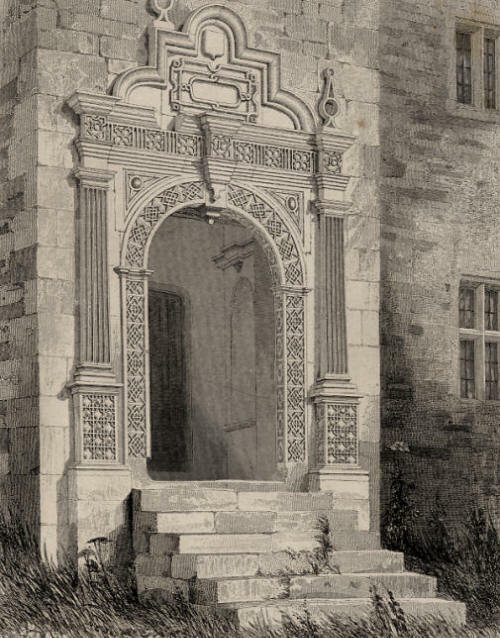 Because Susannah’s brother Richard had an interesting career and also because his descendants include such important families as: the earls of Bessborough (Ponsonby), the earls of Jersey (Villiers), the earls of Westmoreland (Fane), and others we have created a separate page HERE just for him. A genealogical ‘report’ using Family Tree Maker (FTM) software can be read HERE. However because of some glitch in the program the numbering system seems to have gone a little haywire so following the report can be a challenge. We hope to resolve this problem shortly. Be warned too that some of the early connections among different branches of the Craddock family are speculative. A little background: The Man family has a long history of researching its own roots and the following facts are well known. On 26 February 1746/7 John Man (1718-1783) married Mary Balchen (1721-1798) at Holy Trinity, The Minories. John and Mary are the common ancestors of the Man family as all members are descended from their two sons: either Henry (1748-1799) or James (1755-1823). Mary Man’s sister, Elizabeth Balchen (1719-1796), married George Cumberland on 21 September 1749 and they had two children: Richard Dennison (1752-1825) and George (1754-1848). What we did not know until 2008 was how the Man family was connected to the Craddock family and Richard in particular and so what follows is a description of how the connection was made. Previous family researchers have not had much to say about the Balchens, indeed beyond Mary and Elizabeth’s parents nothing much was known. Attempts have been made to connect this Balchen family to that of Admiral Sir John Balchen, but these have so far failed. Furthermore, the question of who Richard Cradoc [Craddock] was and how he fits into the picture had remained unanswered until now. Indeed one suspects that, before The Cumberland Letters was published, Richard’s existence was unknown among family members. As noted, around 1635 a young lawyer from London’s Gray’s Inn by the name of Tobias Craddock married Susannah Bourne and they had at least two children Susannah and Richard. Susannah married Henry Barnes of Somerset and they had a family which included a daughter Susannah (1663-1737). On 10 November 1691 at St. Mary Abchurch, Susannah married a successful London linen draper by the name of John Balchen (1658-1721). In their turn John and Susannah had a large family, the eldest son of whom, Richard Balchen (1692-1738), an apothecary, was the father Mary Man and Elizabeth Cumberland. Thus Richard Cradoc [Craddock] ‘a consul in Persia’ is the great great uncle of Mary Man and Elizabeth Cumberland. Richard’s father, Tobias is the common ancestor of all those members of the Man family recorded on these pages after 1740 and who are alive today. Another piece of evidence comes from a court case (Jodrell against Cropp) in which Martha (Hitchcock) Balchen (Mary Man’s mother) along with her recently married daughter Elizabeth Cumberland and various other members of the Balchen family are in a protracted legal battle over the codicil to the will of Sarah Boulter, one of Richard Craddock’s daughters. 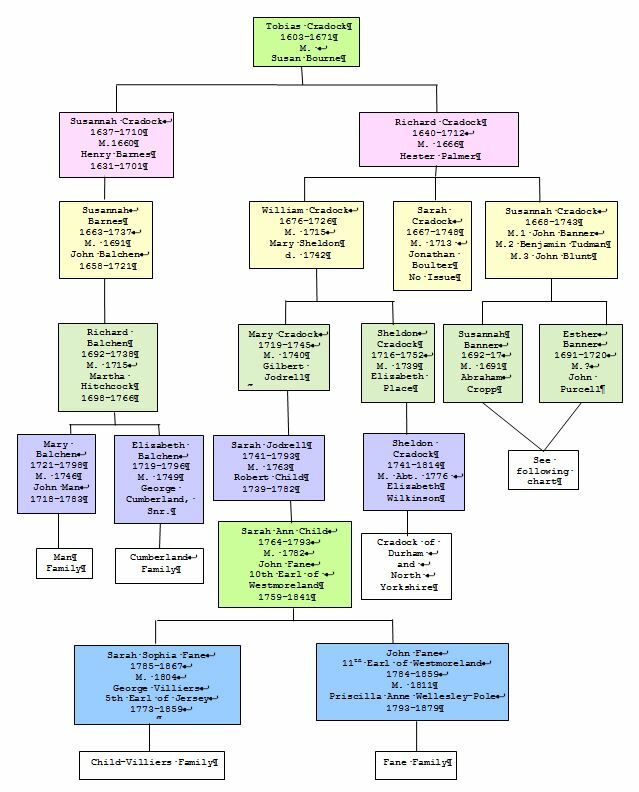 Having now established the relation between the Craddocks and the Mans via the Balchens, we will look more carefully at the Craddock family and in particular the descendants of our great (X8) uncle Richard Craddock. As already mentioned above, Susannah and Richard’s father was Tobias or Toby who was a barrister of Grays Inn. Of their mother’s family – Bourne – we know nothing, as yet. We do have her burial record at St Magnus the Martyr. 8 December, 6th year of the reign of Charles (1630) —True Bill that, at Graies Inne in St. Andrew’s Holborne co. Midd. on the said day, Michaiah Niccolson of Graies Inne gentleman, and John Bowles and George Leigh, both of the said parish yomen, broke into the dwelling-house of Tobias Cradocke esq., and stole therefrom a feather-bed worth four pounds, a bolster worth ten shillings, a pillow worth five shillings, and a blankett worth ten shillings, and eighteen pounds in numbered moneys, of the goods chattels and moneys of the said Tobias Cradocke esq. Michaiah Niccolson and John Bowles were found ‘Not Guilty’; George Leigh was at large. Tobias’s father was John Craddock, D.D. who married Margaret Bateman the widow of a man called Robinson. Of Margaret’s family we know only that her father was William Bateman of Westmoreland. John Craddock’s father was another John who married Ann Latus. In turn John’s father was another John who married Elizabeth Raine/Rayne daughter of George of Thringarth. So going back in time on the maternal sides of these ancestors marrying into the Craddock we have: Susannah Bourne m. Toby Craddock > Margaret Bateman m. John Craddock > Ann Latus m. John Craddock > Elizabeth Raine m. John Craddock > An unknown Tempest married a Craddock. Of interest too is the Latus family and the Waddington family. Returning to Tobias’s father, John Craddock D.D., our great (X9) grandfather. He attended Oxford as an undergraduate and then gained an MA from Peterhouse, Cambridge, and D.D. in 1601. On his appointment to the vicarage of Gainford in 1594, he purchased property in the parish and built Gainford Hall. John was then appointed Archdeacon of Northumberland in 1604 (for more on this click here (<– pdf)) and afterwards he was made Chancellor to the Bishop of Durham (Neilie) in 1619, as well as a J.P. However, he was soon embroiled in a series of legal cases which are described here (<— pdf) as he appears to have been an extremely diligent and zealous magistrate, perhaps overly so when it came to enforcing church doctrine. According to the Dictionary of National Biography (DNB) Craddock and other members of the Cathedral’s clergy (known as The Durham House Group) took control over civil society in the north of England through their dominance of the bench of justices of the peace. In the parliament of 1621 it was objected to strongly that the clergy outnumbered the gentry on the Durham commission of the peace and Craddock was certainly a more conscientious attender of meetings than were many members of the gentry, and so he might well have dominated some sessions. His unpopularity was captured by Durham children who would be wont to chant: “Craddock! Craddock! You stink like an old Haddock!”. A description of his official seal as Archdeacon can be found HERE. John Craddock died in 1627 and it was confidently rumoured that he had been poisoned by his wife (our great X 9 grandmother). She was accused, tried, and acquitted although no records of this trial have yet been found. Another son of John’s (and a brother of Tobias’) – Sir Joseph Craddock – married firstly Elizabeth Cruse and had by her a daughter Margaret who married Ralph Bowes. By his second wife, Jane Maxton, Jospeh had a daughter Peregrina who married Sir William Chaytor. Jane Maxton’s sister Ann married Thomas Bowes. Joseph Craddock hid some of the cathedral plate in his garden at Harperley, as recorded, ante pp. 42, 63.” Joseph Craddock was also the Bishop of Chester’s commissary and as such he acted against local Quakers, including George Fox, and his interactions with such folk can be read here. There is much speculation but not a great deal of proof as to the connection between this Craddock family and the family of the same name originating in Caverswall in Staffordshire. A short paper on this topic will be placed here shortly. A comparison of the two homes – Caverswall in Staffordshire and Gainford in Durham – where these two possible branches of the Craddock family lived can be viewed here. Other Craddocks married into interesting families. For instance Anne Craddock married William Tweddell although there were no off spring. William’s father John Tweddell lived an interesting life which was captured in the book: ‘Remains of the late John Tweddell: being a selection of his letters written….’ (<— at least I believe this John to be Anne’s father-in-law). In the 19th – 20th centuries some Craddocks achieved a certain renown militarily. For instance three brothers: Major Sheldon Cradock (1858-1922) served in the Boer War and World War I with distinction; Lt. Col. Montagu Cradock (1858-1929) was noted for campaigns both in Egypt and South Africa (and was the author, in 1904, of a book called Sport in New Zealand, all about the abundant fish & game, shooting, horse racing, yachting and polo found in that country. This 300 page book can be read HERE. And lastly Sir Christopher Cradock (1862-1914) who rose to the rank of Rear Admiral and who served in the Sudan and China and was later killed in action during the battle of Coronel. An important article written by William Boutflower and that appeared in Archeologia Aeliana in 1918 on the long court case surrounding Thomas Cradock’s will can be read here. Note the pages numbering is wrong — the article is complete — page 55 was mistakenly printed as 56 so there is no missing page 55. A new ‘publication’ on two of the daughters of Richard Craddock/Cradock, Susannah and Sarah, has been released (December, 2012 and revised August, 2014). This report is divided into three: 1. The ENTIRE report of a little over 500 pages. And then, for ease of download, if you have a slow internet connection, the report has been divided into two smaller sections consisting of first Susannah and her three husbands and second her sister Sarah. The format of all three is in PDF. RECENTLY PUBLISHED: ‘Sheldon Cradock and his Successors‘ (<— over 70 pages PDF).